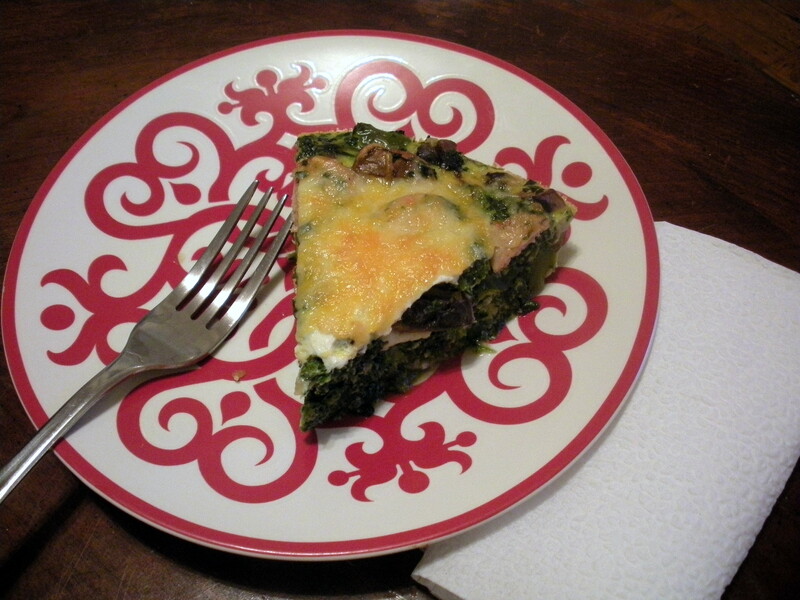 Spinach, Sausage, & Mushroom Breakfast Frittata | Chip Chip Hooray! For this Valentine’s Day edition of the Holiday Recipe Club, we were tasked with using beef, strawberries, or heavy cream (what variety!). I knew I wanted to take a crack at something savory, and given the approaching Valentine’s holiday, a delicious breakfast you could make for your sweetheart seemed like the perfect answer. This would be a tasty and energizing meal to wake up to…or to warm up when noon rolls around and your Valentine rolls out of bed. 1. Preheat the oven to 325 degrees F and spray an 8- or 9-inch pie plate with nonstick cooking spray. 2. Heat oil in a medium saucepan, then add green pepper and mushrooms and cook over medium-high heat until softened and fragrant–about 7 minutes. 3. Add chicken sausage and continue to cook until heated through, about 5 more minutes. 4. Stir in thawed spinach and turn heat to low. 5. In a separate bowl, beat together eggs, heavy cream, and black and red peppers. 6. Spoon chicken and veggie mixture into greased pie plate, then carefully pour egg mixture over top (there may have been some spillage in my kitchen). Gingerly turn the mixture over with a fork or spoon to allow the egg to reach the bottom of the dish. 7. Sprinkle cheese over the top of the frittata. 8. Bake for 30 minutes, or until cooked frittata is set and no longer jiggly in the center. 9. Let sit for 5 minutes, then slice and serve! Makes 6-8 servings. Frittata can be stored in an airtight container in the fridge, or frozen and reheated as leftovers. Don’t forget to check out the other Holiday Recipe Club posters! 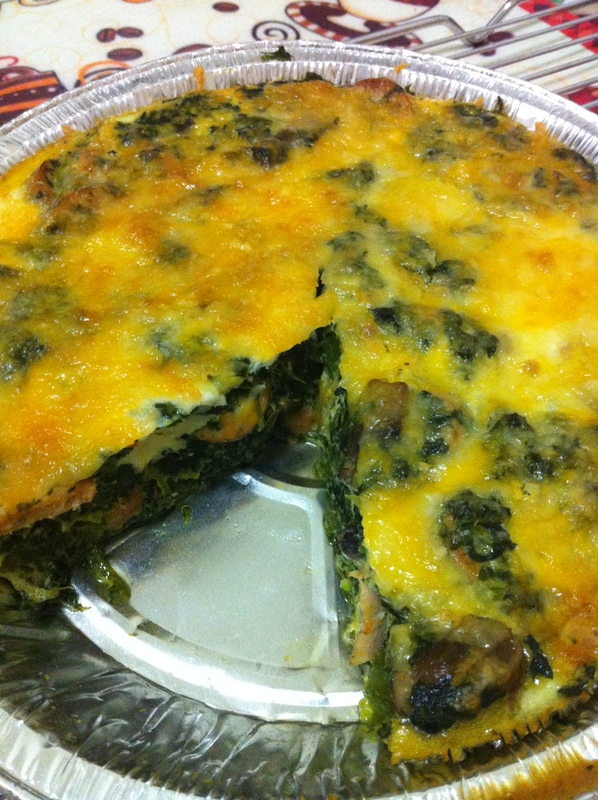 This entry was posted in Breakfast and tagged breakfast, eggs, frittata, holiday recipe club, spinach by chipchiphooray. Bookmark the permalink. Yum!! I love frittata and this one has a nice Mexican kick! Love it!! This looks fabulous! I am totally in the same position… I always wake up way earlier than my BF lol. I will have to make this tomorrow morning for him, he will love it! What a great breakfast! So full of yummy goodness for a special V Day breakfast! I love frittatas and this looks like a perfect meal to start any day! I am going to make this recipe soon. This looks delicious! I could definitely go for brunch in bed 🙂 I sometimes love when my husband sleeps late because it gives me the chance to sneak around in the kitchen and surprise him with the wake up meal! You had me at frittata. There is something about that eggy pie that just works for me. Thanks for sharing with us. I was thinking the same thing, Jennifer. I love that it has a Mexican kick to it! This looks seriously good, and it’s a good protein meal. Sounds amazing! I may have to make this for breakfast tomorrow! Sounds just right. This would make for a great sunday breakfast.